A popular temple of Lord Shiva in the Khotang district, Halesi Mahadev is also known as the Pashupatinath of the east. A much-revered site by the Buddhists and Hindus alike, this place is filled with folklore and legends. 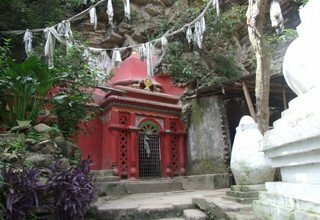 Trek to Maratika Cave is quite a distance below the surface of the land and is the popular spot for religious enthusiasts as well as tourists. 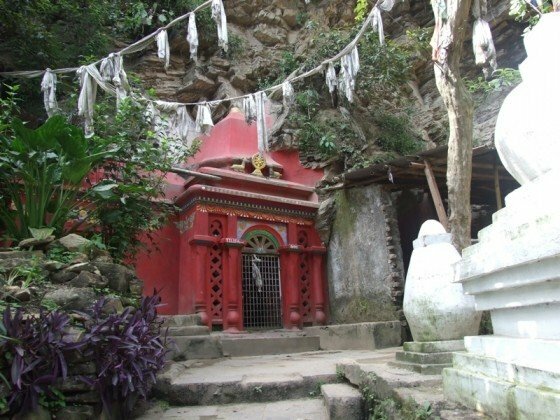 With such great prospects for religious and cultural tourism, the Trek to Maratika Cave is also a huge attraction for nature lovers to behold on the sight of illustrious mountains and incredible landscapes. Beginning our journey in Lamidanda, we now have the option to either drive to Halesi which takes around 4 hours or trek which takes up the entire day. Popular among religious communities of Hindus and Buddhists, during the month of Shrawan, this place calls upon devotees from near and far. The Buddhists hold a dear spot for this place and believe that the monastery is protected by the three hills namely Avalokiteshvara, Vajrapani and Manjushree. It is believed that this place is like a wish full filling jewel that surpasses the grandeur of any other place in the world for spiritual attainment. It is believed that Guru Padmasambhava and Mandarava obtained all noble qualities from this place and accomplished. During puja time, the monks can be heard chanting in the monastery and paying their respect to the Buddha. The temple is situated in between the holy rivers of Dudh Koshi and Sunkoshi and during festivals such as Ram Navami and Ganesh Chaturthi, grand celebrations and religious rites takes place. The trek entails exploration around the Maratika cave along with exciting walks that let s you observe the local lifestyle firsthand. For every variety of travel and tourism in Nepal, we are your best option. With more than 15 years of experience and tie-ups with the best in the hospitality industry, we will make sure your travels are smooth and hassle-free and you get to rekindle your spiritual side. We offer excellent transportation and accommodation facilities along with fluent English-speaking guides. Welcome to Kathmandu. Our representatives will pick you up at the airport and transfer you to our hotel. Known for its rich history and culture, Kathmandu valley offers a wide variety of sights to be seen. A rich pot of Hindu and Buddhist traditions, the artwork in the local temples and spaces such as the durbar square are truly awe-inspiring. We will visit the most iconic places of Kathmandu today that includes temples such as Pashupatinath which is one of the biggest sites for the worshippers of Hindu faith and Boudhanath and Swayambhunath which are significant Buddhist sites. Overnight at a 3-star hotel in Kathmandu. Early in the morning, we will take a flight to Lamidanda which is in the eastern part of Nepal. It is a short flight and will give your glorious views of the Himalayas of Nepal. It is a mesmerizing moment when we first set our sights on the mountains seems so small from the air above but in fact are the tallest structures of the Earth. Lamidanda is known as the gateway to Halesi Mahadev and we will begin our day-long trek to Halesi. Overnight at Halesi Mahadev. Today, early in the morning, we will make a visit to Halesi Mahadev temple. 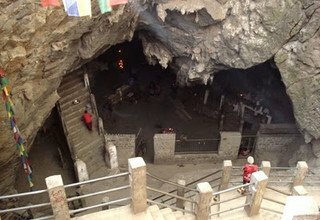 Situated in a cave, this region is believed to be the hiding place of Mahadev (Shiva) at one point of time and the three caves represent the three eyes of the Lord. It is a truly wonderful feeling knowing that we are visiting one of the oldest sites in Nepal, the traces of which can be felt up to the 12th century. Today after the puja we will explore the majestic caves and relax. Overnight at Halesi Mahadev. 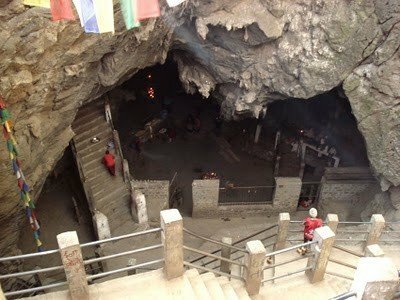 Holding equal importance for people of the Buddhist faith, the legend has that Guru Padmasambhava meditated in these caves for 3 months? This region is made of up three hills a smaller one and two main ones. Next to the cave is the Maratika Chimney Takten Choling Monastery. We will explore the sacred sites of the monastery and call it a rest for the day. Overnight at Halesi Mahadev. From Halesi, after we have had our share of puja, darshan and spiritual guidance, we will make our way to Lamidanda following the same path that we came in earlier. Due to its position in the east, we will have the chance to view some lush green hills and the snowcapped mountains of this region. On reaching Lamidanda we will check into our guest house. Overnight at Lamidanda. From Lamidanda, with the breathtaking view of the Himalayas, and the mountainous terrain of Nepal we will make our way back to Kathmandu via flight. This is one of the most wonderful opportunities to appreciate the mountains and take some good pictures. You can stroll around the local areas upon arriving in the city. Overnight at a 3-star hotel in Kathmandu. Today, we shall explore the beautiful Patan and Bhaktapur. Both the places boast an incredible artwork and immense history. Ruled by Kings, one can see the richness in art and culture this place must have had during its glory days. The famous Krishna temple is a stone temple which is an example of fine stonework and the museum holds many ancient sculptures. In Bhaktapur which is the capital of Newar heritage, we can see the famous Naytapola Temple a towering beauty of woodwork and the equally magnificent Dattatraya temple. You can also for souvenirs in the meantime. Overnight at a 3-star hotel in Kathmandu. Day 9: Final Departure from Kathmandu. Being your last day, our representative will drop you to the airport ending you Nepal tour. * 4 nights accommodation in twin sharing basis at 3*** Hotel in Kathmandu. * 1 experienced helpful and friendly guide, (1 porter for 2 participants), their food & accommodation, salary, equipments & insurance. * Domestic flight ticket from KTM/Lamidanda/KTM (flight only possible Sunday and Wednesday) and airport tax. * First Aid Medical Kids.